Back-to-school sales are in full force. Wisconsin’s Sales Tax Holiday is Wednesday-Sunday, Aug. 1-5. Iowa’s Annual Sales Tax Holiday is Friday-Saturday, Aug. 3-4. 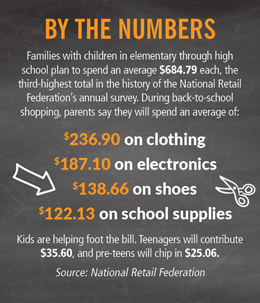 Don’t let the back-to-school expenses sneak up on you. Take advantage of Dupaco’s You Name It Savings accounts to systematically save from your payroll or checking account, so you’ve got a head start on next year’s back-to-school shopping! What are your go-to moves that help your family be prepared for another school year?